Duawne F. Starling « joDah Ministries, Inc.
Duawne’s resume is virtually a who’s who in music. He has worked with artists such as Kirk Franklin, Donnie McClurkin, BeBe and CeCe Winans, Fred Hammond, Nicole Mullen, Michael W. Smith, Sandy Patti, Michael Jackson, Patti Austin, Dolly Parton, Michael McDonald, Kelly Price and countless others. After distinguishing himself as one of the top supporting vocalists in the music industry, it was evident that it was time to launch his solo career. Not only does Starling have the vocal schooling of years in the studio and on the road, he is also an accomplished songwriter, actor, former model, and co-host of Magnify Him on the 3ABN Network. As well, he is the host of In Your Own Words, an Internet radio show on the Family New Radio station. Three of his musical compositions, “Finally I”, recorded by Daryl Coley, “Everything”, and “With This Ring” recorded by Starling, are on the chart topping wedding compilation CD “With This Ring” Volumes 1 and 2. As well, his voice can be heard singing “Imagine A Place”, the theme song for Tokyo Disney in Tokyo, Japan. Ultimately, Duawne describes himself as a “simple man” and has one goal. “I just want to be all that I am intended; a man of honor, a faithful husband and a loving father. I want my life to bring light to the world around me”. 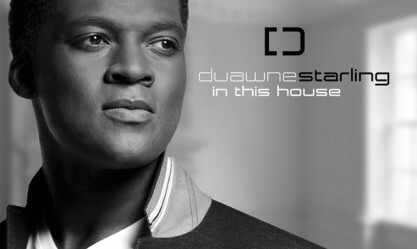 Duawne released his debut self-titled CD in 2004, and is getting ready to release his sophomore CD, “Deeper Faith” in winter of 2015. He is soliciting your financial support as he now embarks on promoting this project nationally. For more information on how you can support Duawne's ministry, please contact him at: [email protected].